Economic inequality and cultural difference are key issues in Southeast Asian studies, in particular with regard to the analysis of contemporary and historical patterns of labour migration. Migration routes traverse the regions of mainland Southeast Asia, linking cities and rural areas, sometimes across national boundaries. To a large extent, they relate to global commodity chains, emerging industries, and various development initiatives producing regionally specific labour demands. These migration dynamics often imply increased population movement from economically (and geographically) marginal regions, while remittances become essential parts of local household economies. 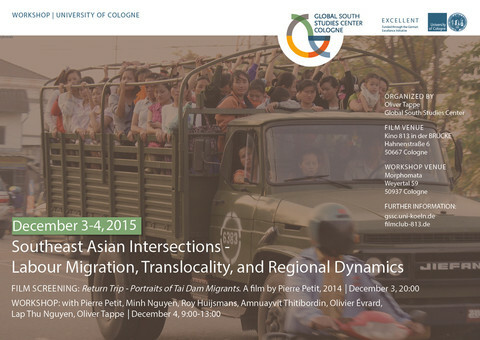 This workshop explores regional varieties and translocal effects of labour migration in Southeast Asia. We aim to investigate shifting sociocultural configurations in home and host societies, the emergence of new class and gender identities, and changing translocal networks and infrastructures of labour mobility. Various actors such as migrant workers, their relatives in the villages of origin, labour recruiters, and border police have their particular roles in the interplay of relationships, (power) asymmetries, opportunities and constraints. Processes of social differentiation and cultural resilience shape the everyday life in societies affected by (partial) in- and out-migration. 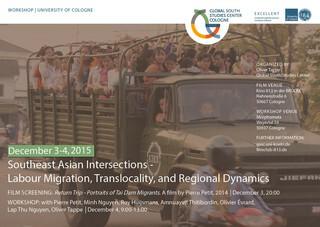 The regional perspective and the historical contextualisation of present-day migration regimes followed in this workshop will contribute to a better understanding of Southeast Asian migration patterns as transnational and translocal phenomenon. The workshop will start on Thursday evening with the documentary film Return Trip: Portraits of Tai Dam migrants, directed by the anthropologist Pierre Petit (Université Libre de Bruxelles). Afterwards a round table will discuss the issues raised and visualised in the documentary. Friday morning will be dedicated to individual presentations and case studies from mainland Southeast Asia.